I had forgotten how much I love sweet potatoes. My Mom digs them and I can't even remember the last time I had one! Preheat oven to 400 degrees. Line a cookie sheet with aluminum foil. 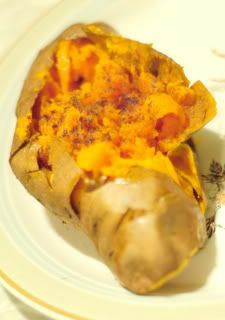 Clean off the sweet potatoes, then pierce with a fork or knife in several places. Cut off the ends and brush a bit of olive oil on the tops. 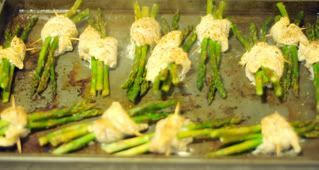 Place on cookie sheet and bake for 30-45 minutes or until soft. 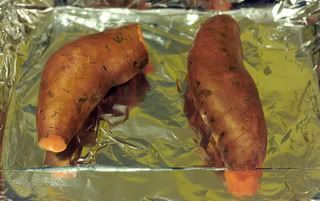 When finished, cut open the top of the sweet potatoes with a slit, and push the sides of the potato in (wearing oven mitts) until the insides come out the top. Top with butter, cinnamon, or any spices of your choosing. Salt, pepper, nutmeg, etc are good as well. *I also added Ms. Dash chicken seasoning. Preheat oven to 350 degrees (or turn down oven to 350 degrees if you're already baking sweet potatoes). 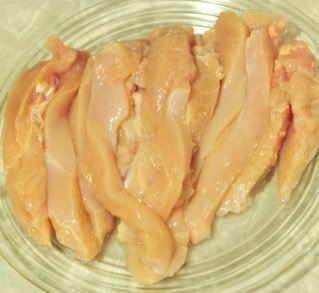 Cut chicken into 8 or 10 strips, each about 1x5 inches long. 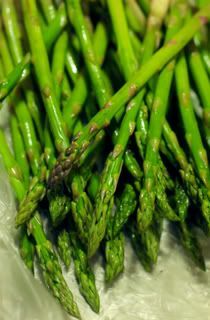 Wrap each strip around 2 or 3 uncooked asparagus spears. Fasten with toothpicks. Place in a covered baking dish that has been sprayed with nonstick cooking spray. (I did a cookie sheet.) Sprinkle with lemon juice, onions and spices. 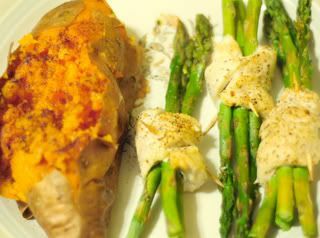 Bake for 20-30 minutes or until chicken is no longer pink. Remove toothpicks. 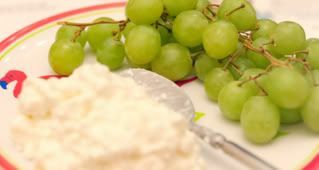 Serve hot or refrigerate until chilled and serve cold. This is going to be a great snack for me (the leftovers.) My trainer says that every time I put something in my mouth, she wants it to be one complex carb and protein. 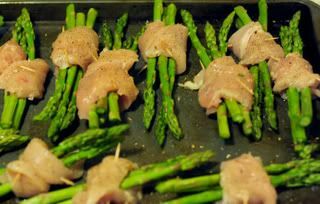 that looks delicious except i don't like asparagus. wow, your post looks so yummy! I'm going to have to try it all! Thanks for stopping by my blog, I will be checking yours out regularly!